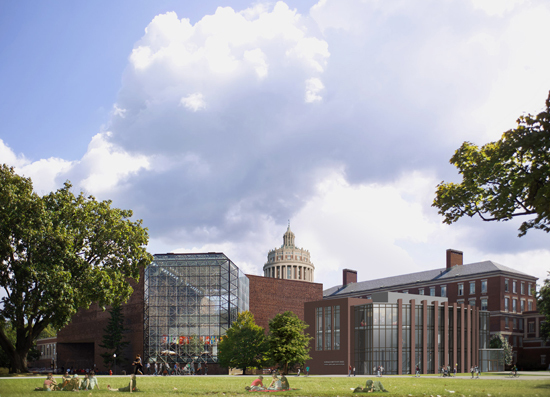 The University of Rochester's trustee executive committee has approved the construction of a building to house new programs in digital media studies and audio and music engineering, University President Joel Seligman has announced. Designed to be a hub at the cross-section of the study of arts, sciences, and engineering on campus, the Ronald Rettner Hall for Media Arts and Innovation will provide students in the new digital media studies major with a place to gain both practical skills and a theoretical understanding of digital technology. The building is named for new University Trustee and philanthropist Ronald Rettner who provided the lead gift that is enabling the University to begin construction this summer. It is scheduled to open in the fall of 2013. 3D Virtual Model: Ronald Rettner Hall for Media Arts and Innovation. "Ronald has been a visionary supporter of education for more than two decades," said Seligman. "As an entrepreneur himself, he recognizes the importance of hands-on and collaborative student learning and the critical need to bring together knowledge and insights from many different disciplines." The three-story, 18,900-square-foot facility will feature an engineering fabrication lab where students can build project prototypes, a multipurpose learning studio, group study areas, and exhibit space for students to display their projects. The state-of-the-art facility also will contain sound and video recording studios, high-end computers, and 3-D printers, the latest manufacturing technique to convert digital design software into actual models. "I am excited to be a part of this cutting-edge venture," said Rettner. "Interactions among students complement everything in the classroom, and by bringing humanities, engineering, and technology under one roof the potential for collaborations are endless." Designed by the architectural firm Goody Clancy, the building will contain flexible spaces specifically for collaboration and interaction. The open design of the new facility has a space on each floor overlooking the level below to encourage interactive work. Rettner Hall will be open 24 hours a day. "Our students' capacity to think critically and flexibly is the key to their future success," said Peter Lennie, provost-designate and Robert L. and Mary L. Sproull Dean of the Faculty of Arts, Sciences & Engineering. "Rettner Hall will provide them with a place to harness their talents broadly and discover new ways to connect the creative arts to the sciences and engineering." The Ronald Rettner Hall for Media Arts and Innovation will be located in the Wilson Quadrangle on the River Campus between Wilson Commons and Morey Hall. The project will also include several renovations to the adjacent Morey Hall. Total cost for the project is $12.8 million. A member of numerous civic and charitable boards, Rettner is president of Rettner Management Corporation and is managing partner of Baron Associates, a real estate investment, finance, and management company with national holdings. Earlier in his career, Rettner was a securities analyst and cofounded The Vitamin Shoppes. His recent leadership gift supports the construction of the new building as well as The Meliora Challenge: The Campaign for the University of Rochester. Since 1975, Rettner has served as director of the Morris B. Rettner Foundation, an organization honoring his father's commitment to the community that supports scholarships, research, and civic projects. He earned his undergraduate degree in political science at Washington University in St. Louis and master's degree in business administration and urban planning from Columbia University, and attended the evening division at Fordham University Law School. He also has served on the National Council of Arts and Sciences at Washington University since 1990 and was the recipient of that University's Distinguished Alumnus Award in 2009, the Arts & Sciences Distinguished Alumnus Award in 2007, and the New York Regional Cabinet's Alumnus of the Year Award in 2009. He has also guest lectured on real estate topics and participated in discussions concerning real estate development.